When the Constitutional Convention adjourned on September 17, 1787, few Americans anticipated the document that emerged from its secret proceedings. James Madison, Alexander Hamilton, and the other framers had fashioned something radically new, a strong national government with broad powers. A fierce storm of argument soon broke out in advance of the state ratifying conventions that would decide the new plan's fate as Federalist supporters, Antifederalist opponents, and seekers of a middle ground praised, condemned, challenged, and analyzed the new Constitution. Here, in chronological order, are more than sixty newspaper articles, pamphlets, speeches, and private letters written or delivered during this ratification debate. Along with familiar figures such as Madison, Hamilton, and Patrick Henry, are dozens of lesser-known but equally engaged and passionate participants. 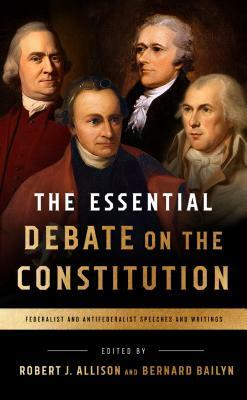 The most famous writings of the period--especially the key Federalist essays--are placed in context alongside the arguments of insightful Antifederalists such as "Brutus" and the "Federal Farmer." Crucial issues quickly take center stage--the need for a Bill of Rights, the controversial compromises over slavery and the slave trade, whether religious tests should be imposed--and on questions that continue to engage and divide Americans: the relationship between the national government and the states, the dangers of unchecked presidential power and the remedy of impeachment, the proper role of the Supreme Court, fears of foreign and domestic corruption, and the persistent challenge of making representative government work in a large and diverse nation. Bernard Bailyn is Adams University Professor Emeritus at Harvard University and the author of numerous books, including the Pulitzer Prize-winning The Ideological Origins of the American Revolution and Voyagers to the West and the National Book Award-winning The Ordeal of Thomas Hutchinson. Robert J. Allison is professor of history at Suffolk University in Boston and also teaches at the Harvard Extension School. Allison is the author of The Crescent Obscured: The United States and the Muslim World, Stephen Decatur: American Naval Hero, 1779-1820, A Short History of Boston, and The American Revolution: A Very Short Introduction.